A spacious 4 bedroom detached home benefitting from a quality conservatory extension which can be used throughout the year as an extra reception room. This former show home was built by Gleeson Homes in 1996 and our vendors have owned the house since new. The property is situated within this small close near to the local primary school, convenience store and parish church. The village of Hurstpierpoint provides all day to day needs and is 2 miles away whilst the mainline station at Hassocks is 3.7 miles away. The accommodation includes an entrance hall with stairs to the first floor and a cloakroom leading off it. The kitchen/dining room has a window to the front and a door to the side aspect, fitted with a range of white cupboards complimented by integrated cooking appliances. A wide archway opens to the good size living room with access to a useful study/playroom and an archway to a generous double glazed conservatory with under floor heating. On the first floor the master bedroom has a range of built in wardrobes and an ensuite shower room. 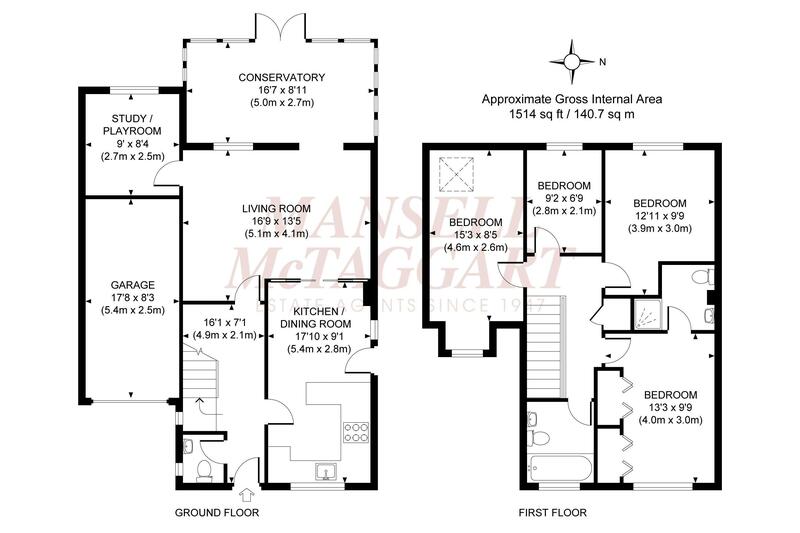 There are 2 further double bedrooms, a single bedroom and a family bathroom. Outside a private pebblestone driveway flanked by lawn leads to the garage with power and light. A side gate opens to the west facing 44’ wide x 34’ max rear garden which is laid to lawn with brick steps from the conservatory. Benefits include gas fired central heating (the boiler is located in the airing cupboard) and uPVC framed double glazed windows. Situated in this small close with common land/play area near by, ideal for children and dog walking etc. The village of Sayers Common is surrounded by open countryside which is interspersed with public footpaths and bridleways linking with neighbouring districts. The A23 is close at hand giving access to the M23/25, London, Gatwick Airport and Brighton and there is a public house and a village store. Schools: Albourne Primary School 1.2 miles. Twineham Primary School 3 miles. St Lawrence Hurstpierpoint Primary School 2.1 miles. Hurstpierpoint College 3.3 miles. Burgess Hill Girls 5.6 miles. N.B Please note that catchment areas need to be confirmed. Stations: Hassocks Mainline Railway Station (London Victoria/London Bridge approximately 54 minutes and Brighton 12 minutes) 3.7 miles. Conveniently located for 3 primary schools, Hurstpierpoint College and Hassocks mainline station which is 3.7 miles away.